DISCLAIMER: It's difficult to find much information in English, so this may not be 100% accurate. Feel free to add to/correct my information, or ask questions. Before Dream5, there was avex audition 2006. This audition led to the discovery of multiple talented individuals, such as Shigemoto Kotori (Off-topic: Arai Hitomi was another). Kotori became a regular on the NHK program, Tensai TV Kun MAX. 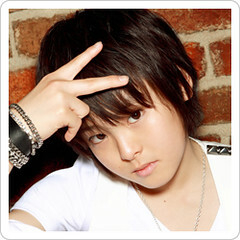 In November 2009, Tensai TV Kun MAX held auditions for four boys and girls who could sing and dance. This led to the discovery of Hibi Mikoto, Takano Akira (the only boy in the group), and Oohara Yuuno. Tamagawa Momona didn't actually take part in the audition, but was added by the judges at some point. It's hard to find the PVs online, so forgive the quality. This is mirrored and missing the end, but Tabidachi no Uta is a great ballad. This song is more fast-paced, but has no PV. Edited by LunaLupus, 20 August 2011 - 11:32 PM. I remember this group! I watched their cover of koi no dial 6700 a few months ago and remembered liking it (especially since there were AAA members in it lol). Not too acquainted wit this group but I would like to see more from them. No, Akira is a boy. I guess they just chose the best, and they just happened to be mostly girls. Well I'll check through these videos slowly, thanks for the detailed intro! I wanted to be the first to post, but I had to wait until my migraine died down a bit, and my neighborhood got a little quiet. I clicked on your blog link a few days ago and watched a couple videos, including "I Don't Obey" and "Koi No Dial 6700". I just watched the two videos from YouTube you linked (with headphones on, so I won't disturb the neighbors, and my migraine can get worse.) I like this group, although I don't have a favorite member yet. (It probably won't be the boy. ) I noticed that the "dancers" sometimes sing background vocals. This is like another Avex group, Tokyo Girls' Style, not to mention every H!P group. And it's too bad they don't wear glasses. I like girls with glasses! The Finger 5 and Morning Musume versions of "Koi No Dial 6700" are both on the tracker. ^ Thank you! Do you mind if I summarize that in the first post? ^ Good to see you here, but that migraine needs to get lost. My favorite is probably Kotori. I love that husky voice of hers. The dancing/singing thing mostly refers to their specialty. (Although one of the singers, Kotori, is apparently a skilled belly-dancer. ) I kind of like the idea that they tell you that, though. Although, there is a song where they all (I think) get solos. As for the glasses, I wish Mikoto wore them all the time. So cute! Interestingly, Finger 5 had 4 boys and 1 girl. It's quite possible they were the inspiration for Dream5, only reversed. I'm in a total in love with Akira! I'm happy to see their thread, I've been browsing the Music thread like forever! ^ When I think about it, you don't really see many groups with any boys that age. That makes them quite unique among the current Japanese groups. I almost typed "idols", but that term doesn't really fit, does it? From what I've seen so far, they seem like a pretty fun group. I really Love this group!!! Mainly because they're Young and it's hard to find idols or artists at this age. Especially with 4 girls and 1 boy. ^ I didn't really notice, but you're right. Interestingly, I think all the girls probably have long hair to offset that. It's like everything is balanced so it's not too boyish or girlish. If that makes sense? ^ I wasn't really sure what Akira was at first. So, you aren't alone. ^ Their average age is lower than most groups. Also, I actually belong to the forum you linked, and it is kind of empty right now. EDIT: I've edited the first post a bit. Edited by LunaLupus, 16 February 2011 - 11:42 PM. I hope this group gains more popularity. They deserve it. @Lunalupus i was reading another thread and noticed your banner. Thanks for your comment and thanks for starting up this thread. ^ It took me a few seconds longer than it should have, but it dawned on me who you are. Anyway, you're welcome, and thank you for posting here. I hope I gained your blog a few more visitors with my link. To make it clear to everyone, Kira-Chan is the Kira whose blog is linked in my signature. If anyone hasn't visited, there are a couple videos you can see there, that aren't here (since I can't embed them like the youtube videos). Edited by LunaLupus, 17 February 2011 - 05:54 AM. I finally got their recent single and their mini album. Loving them. Can't wait to see/hear what they come up with next. I have good (but late ) news! 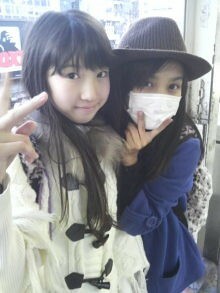 I know little Japanese, so I haven't been checking Kotori's blog lately. According to her blog, they were recording last week, and they've been having dance lessons since then. Also, if I understand correctly, two days ago they had measurements taken for new outfits! Some blog pics in the spoiler. You can click for bigger pics if I linked them correctly. I saw the photos in your spoiler. So, one of those girls does wear glasses! Yay! I feel like hugging Akira now! He looks so kewl and cute in that hairstyle. He has a very good skill in dancing! The epicness of him started from his name I guess! Oh, love him! Mikoto + glasses = WIN. that video of Kotori, how old was she when i was filmed? Shuch a beautiful from such a young girl.